With a young family, who are avid internet users, online safety is a priority for me. I use a couple of measures both in their devices (PCs, tablets) and provided by the Draytek router. For the last couple of years I have purchased the Web content filter license ( a.k.a DrayTek WCFB GlobalView 1-Year Web Content Filtering (Group B)) , which has worked fine, although it lacks any real feedback and has no monitoring features. I decided to look for other options this year after the license expired and stopped validating URLs. It did this silently without any notifications ! so the internet was wide open until I realised. Having previously used OpenDNS before, and being very impressed (www.opendns.com), I decided to have another look at setting it up with the Draytek. The difficulty was updating the OpenDNS ip address for my network, which is dynamically allocated, and relied on a client side application to update the OpenDNS registry. After an hour of fiddling and lots of internet searching I had it working, so here's how. Login to your Drayteks' admin page (mine is at http://192.168.1.1) and go to the LAN->General page and set the primary and secondary DNS addresses. Your Draytek will now use the OpenDNS DNS servers to resolve all URLS, but OpenDNS doesn't know to associate your ip address your your account. To do this you can use the Dynamic DNS features of the Draytek. Most home public IP addresses are dynamically updated by their ISP. To update OpenDNS with our IP address we need to use another service provided by the same company DNS-O-MATIC (https://dnsomatic.com/). This service provides a standard API and will update OpenDNS. Go to DNS-O-MATIC (https://dnsomatic.com/) and use your OpenDNS credentials to login. 4.1 Create a service for your OpenDNS account. This is very easy as there are only a few options available. 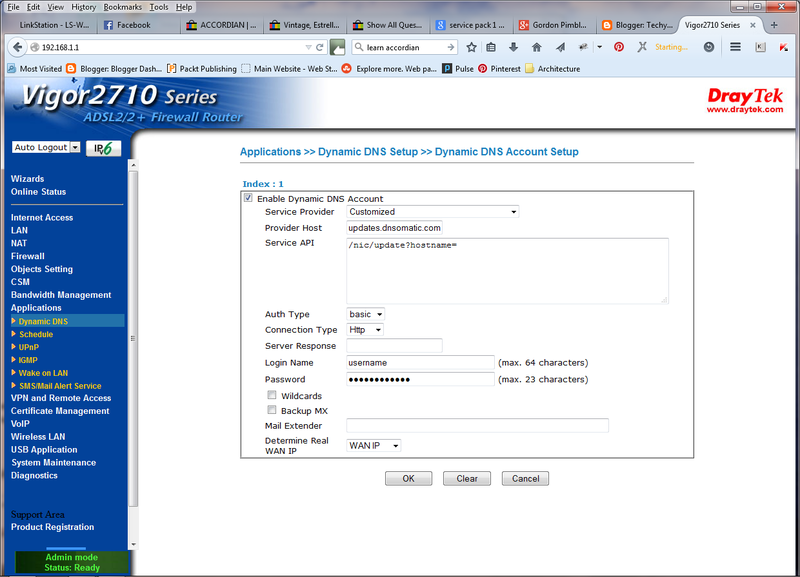 Go to the Dynamic DNS setup page of your Draytek (Applications->Dynamic DNS). Click on index entry '1' to configure the Dynamic DNS. You will obviously need to enter your username and password for your OpenDNS account. Once completed click OK, and enable the Dynamic DNS feature on the previous screen. I found it useful to reboot my router, and devices, to flush their DNS caches before everything was working correctly. To check that it is all connected together first click the 'Force Update on the Dynamic DNS setup page, then use the 'View Log' option to check that your router has connected to DNS-o-matic successfully. Then log into DNS-o-matic to check that it has registered the call. You can use the 'History' feature of your service to see the update. If both of these are ok then everything is working as expected. Yow should now log into your OpenDNS account to configure the types of sites that you want to block. 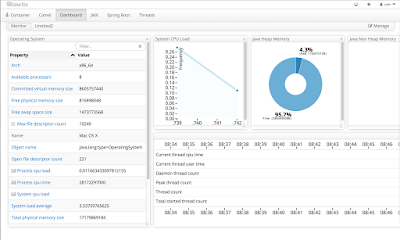 You can also check the metrics to check that everything is working. OpenDNS provides a far more comprehensive service than the Draytek Web content filter and it's FREE ! !